A few days before the break, Fordham medievalist extraordinaire [*blush*], Boyda Johnstone, had a stroke of brilliance. Boyda organized a week-long online dissertation writing group for graduate students at Fordham and beyond. The purpose of the online dissertation group was simple: we wouldn’t critique one another’s writing; rather, we would focus on accountability in the writing process. Each group member was asked to set daily and cumulative goals for the week, then members would report on their daily and weekly progress. These goals were public, specific, and realistic (i.e. read and summarize 3 articles on notecards; write for 1.5 hours in the morning; notes toward response paper for Hapless Orphan). Throughout the week, we gave each other advice on the writing process, suggestions for professional development, and general motivation for the hard task of writing. In effect, each individual group member spent the week consciously and publicly organizing her time; as a community, we held one another accountable and supported one another. 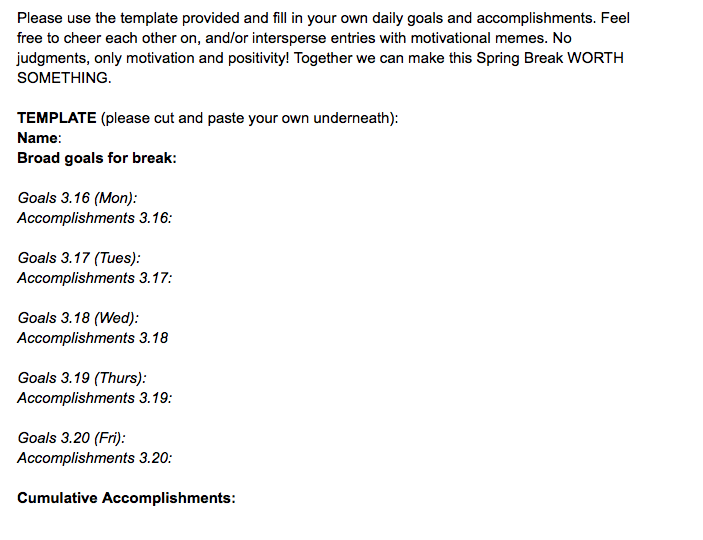 Within this template, our goals were specific, but informal. We used the comment function to engage with each other’s goals. The encouragement was consistent and inspiring. This kind of structured online engagement made me not only more purposeful in my use of time, but I also felt accountable in reporting back my accomplishments. Christy Pottroff is a PhD Candidate in English at Fordham University in New York City where she specializes in nineteenth-century American literature, queer and feminist theory, and rural studies. Thank you, Christy!